to get you on track to online success. Nibble away– feed your hunger for knowledge. What are the things that separate a brochure website from a sales-producing website? The maturity of the website falls into 1 of 5 levels. 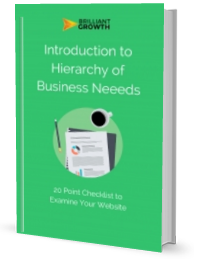 This 20 point checklist gives a brief introduction to the concept of Hierarchy of Business needs, so you can see your website’s current level in the hierarchy. 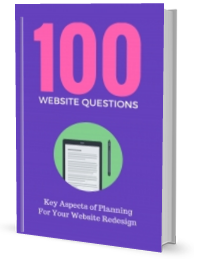 Your website wish list stretches for the better in this comprehensive website redesign questionnaire. Your mental muscles flex as you map out all the important things that impact your website redesign. With18 subjects to explore. You will emerge with a sense of clarity for your website redesign project. The technology treadmill is set to full speed ahead. Your website needs to stay up to date to keep in tip-top shape. 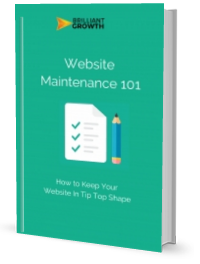 In this ebook, we’ll cover some fundamentals about website maintenance. Your website needs protection from all manner of creepy crawlies, threats, and technology advances. into large revenue gains when the conditions are right.